Bombalai Hill is 530meters above sea level. Only about an-hour jungle walk. 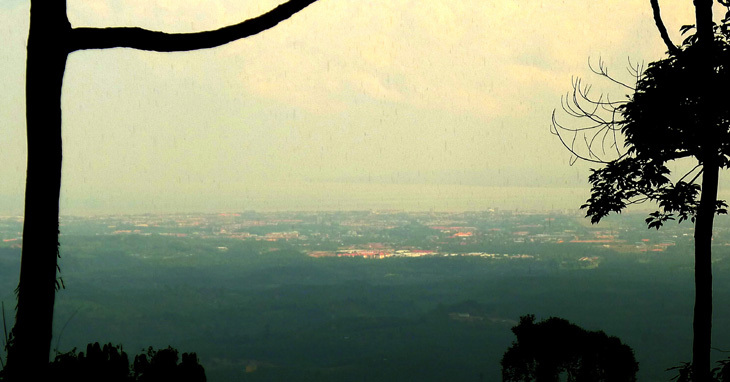 From the hill top you have a panoramic view of oil palm plantations, Tawau town and at the horizon the Sulawesi Sea! 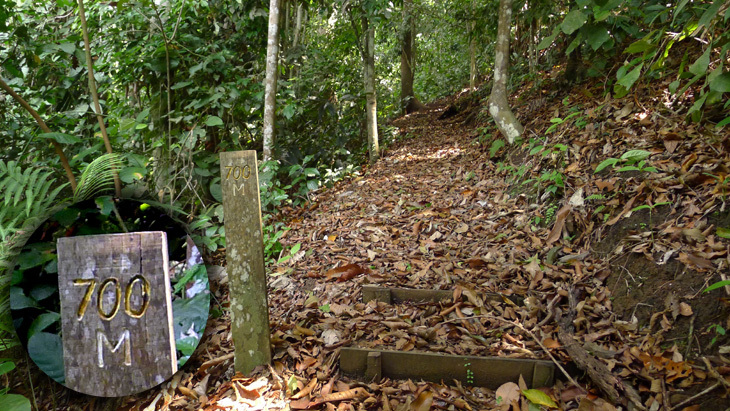 You do not need to enter Tawau Hills Park through the ticket counter at the entrance gate. Because Bombalai is at a separate area outside the park's entrance. You do not need to buy a ticket to go to Bombalai Hill, thought for foreign travellers it is always good to show your faces at the ticker counter and keep the management aware of their responsibility of safeguarding hikers to Bombalai. To Bombalai Hill, you Do not enter the park entrance and do not have to but a ticket. Just from the car park walk toward the road end where a bushy plantation road began along the boarder of the Park. The plantation road is the starting point of your hike to Bombalai Hill. 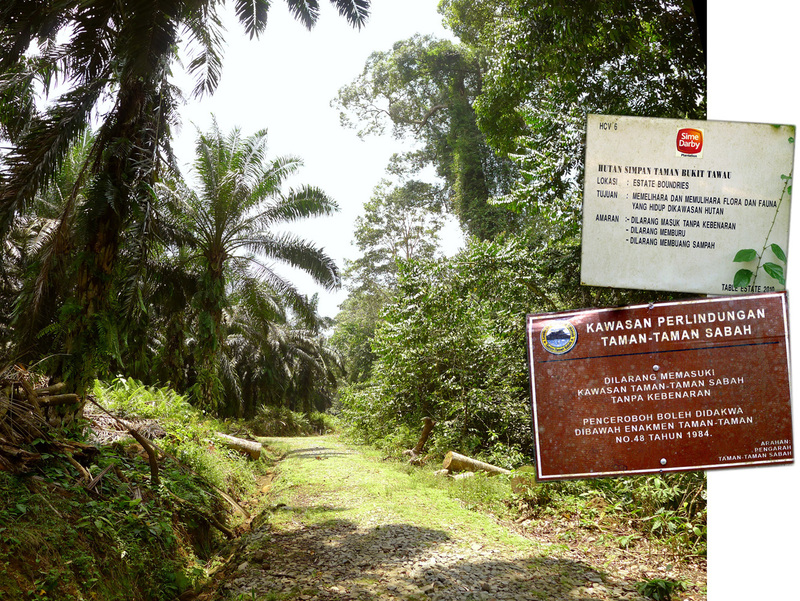 Bombalai Hill and Park's main area (government protected land) is broken and separated by a 1Km oil palm plantation (private land). 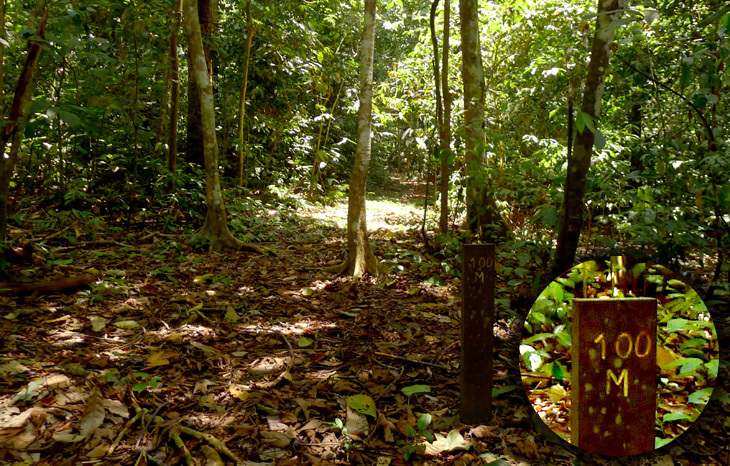 You witness the two difference ecology between the human oil palm trees and the original rain forest. After a 1 Kilometres of plantation road you will find at the left hand side the junction of the 900 meters trail to Bombalai Hill. 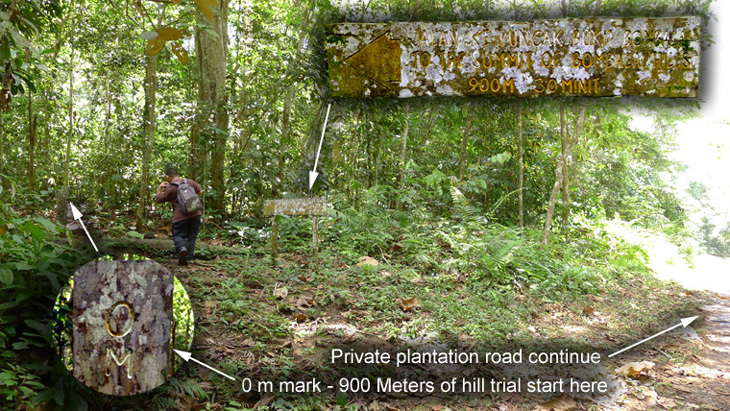 The hikers trail is very much narrower then the plantation road wide enough for plantation trucks. 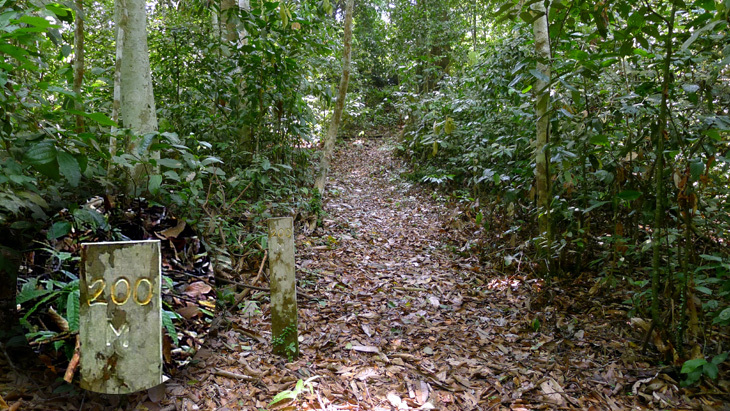 Though this trail is shorter then the plantation road, this jungle path will take you longer time in climbing because it is an uphill trek in the jungle. Certain section can be slipperly during wet seasons. Always go with a partner in case of casualty. 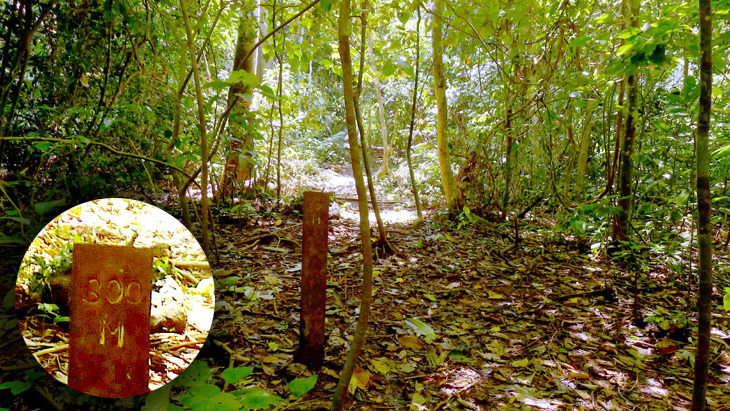 Do not walk out of the trail and enter protected forest. At least not to venture too far in for fear of being mistaken as poachers or hunters. 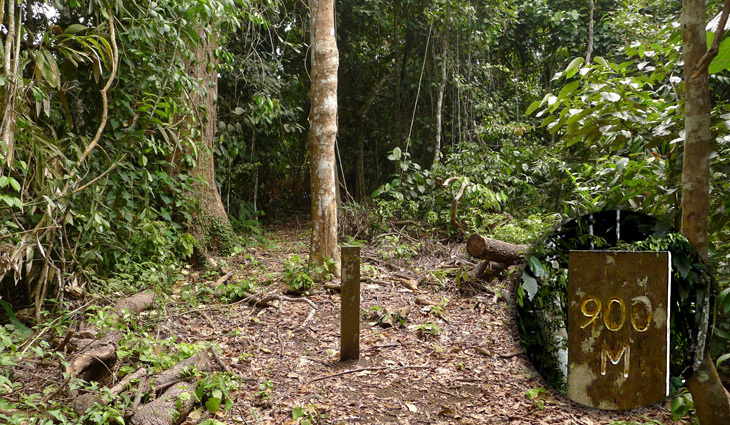 It is common for poachers entering protected areas to capture rare animals and plants. Even more common is local hunters with licensed hunting guns hunting for the plentiful wild-boars (wild-pigs) at night in oil palm plantations. 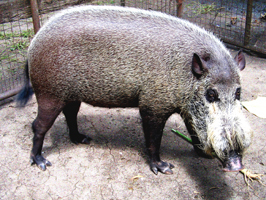 Picture of a Bearded Pig or Wild Boar (Sus Barbatus - Babi Hutan) in the Mini Zoo of Yuk Chin Primary School, Tawau Town. The zoo was shut down on 17th September 2015 by Sabah Wildlife Department after animals found in squalid conditions. But some common easy to maintain animals are still kept there. The zoo is still available for interested public to enter with a small fee. If you are interested, the school zoo is located on you way to Tawau Hills Park if you are using the Kuhara Road. 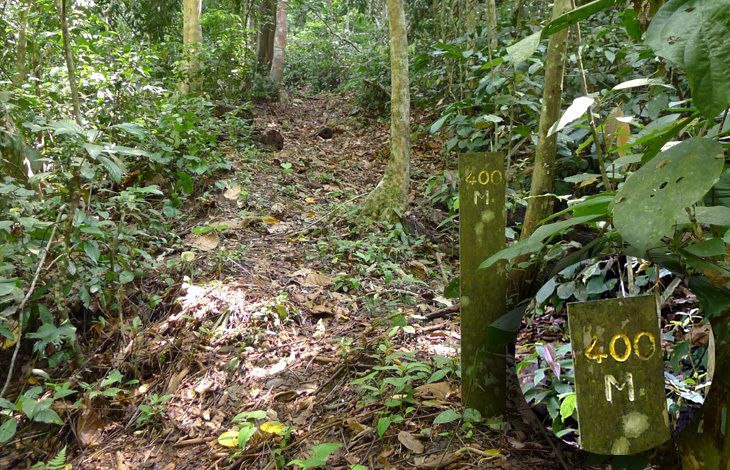 The 300 meter mark of jungle trail to Bombalai Hill. Another 600 meters to go. From 400 meters onward, the path gets steep and steeper. Exotic plants begin to show up from here. Finally the end of 900 meter jungle trail to the submit of Bombalai Hill at 530meters above sea level. From the summit of the hill you have a panoramic view of surrounding oil palm plantations, Tawau town and the horizon of Sulawesi Sea!